A chilling tale of murder unfolds during a fierce September hurricane on the Maine coast in this haunting story of two deaths mysteriously bound together by the long reach of time. As Hurricane Ivan bears down on the coast, the crew of the Maine Wind retrieves the body of a young woman from the sea. Who is she and how did she die? 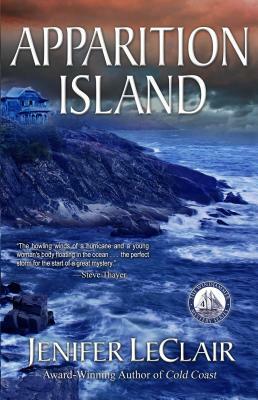 The search for the woman’s identity thrusts Homicide Detective Brie Beaumont into an investigation on Apparition Island in the aftermath of the violent storm. A verdict of undetermined death begs the question: Was this an accidental drowning; did Claire Whitehall commit suicide, or was she murdered? As a baffling investigation unfolds, Brie is drawn back into a decades old cold case—one that has cast its shadow into the present, where she could become its next victim. In her Windjammer Mystery Series award-winning author Jenifer LeClair vividly captures Maine's islands and coastal regions where she has sailed since 1995. The series includes Rigged For Murder, Danger Sector, Cold Coast, Apparition Island and Dead Astern. Ms. LeClair lives in Vadnais Heights, Minnesota with her family. Visit her website at www.windjammermysteries.com.